At the core of exceptional leadership is the ability to lead self. Some level of proficiency can be demonstrated by simply focusing on leading others. 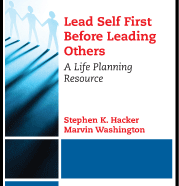 But to achieve transformational results, leading self is essential…Learn more about this life planning resources written by Stephen Hacker and Marvin Washington. Link here to buy book on Amazon or from Business Expert Press.